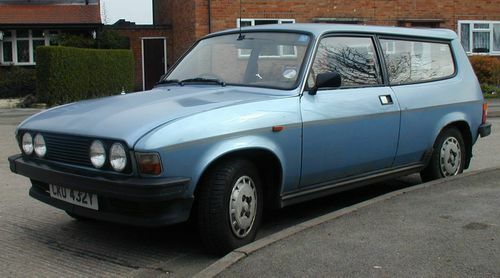 Here are a few pictures of my current everyday car, a luxury 1982 Austin Allegro Estate 1.5HL (Metallic Blue and Rust coloured.) 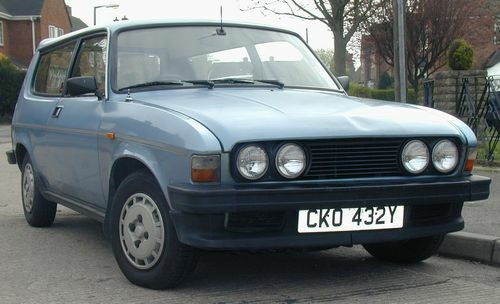 Notice the smart round headlamps (fitted when the original square ones rusted out) and the slightly off-colour driver's side wing. The rust around the rear wheel arches and the slightly dented front panel are nice touches too. As are the extremely juddery clutch, the enormous thirst for oil and the clouds of blue smoke it leaves behind it wherever it goes. Back to Mikey's old car page.